I counted 21 total different kinds of holiday cookies that I baked or ‘formed’ these past couple of weeks. Can you believe that? I didn’t think it was a lot of cookies but after looking at all of them, I was pretty impressed. I actually had to load them into a box so that I could sort them all out. Most of not all of them were dreamy and I only say that as I watched my wife and kids expressions after eating them. This was one of those delicious morsels and one that is way too simple to make. 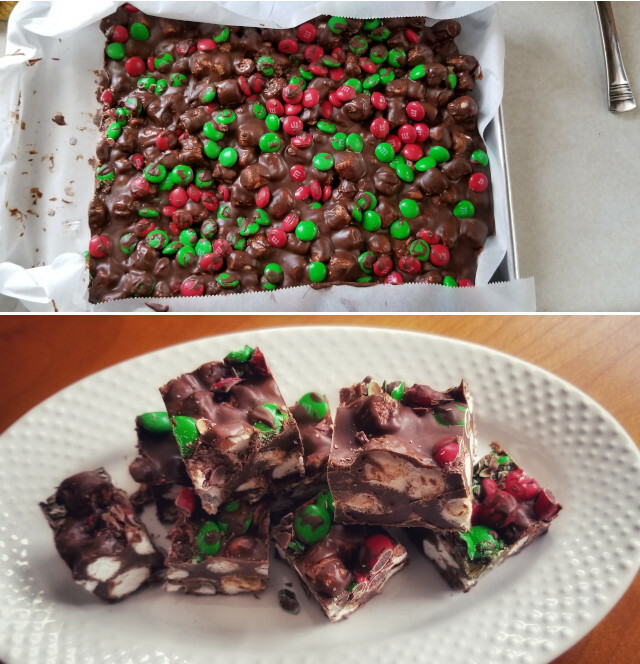 It’s essentially melted peanut butter and chocolate chips, marshmallows, and holiday colored M&Ms. Sugar bombs, if you will but everyone seems not to mind that around this time of year. Pretty standard holiday baking ingredients. I can’t tell you how many bags of chips I have gone through, as well as butter, so I was a bit glad this one was not utilizing butter and sugar! That’s how much I have been going through. You have a couple of options for the melting of the chips and peanut butter. You can use a double boiler method, or you can utilize your microwave. I go microwave as it is quicker and one less dish. To a microwave safe bowl, add in the peanut butter, chocolate and butterscotch chips. Melt, stirring every minute, up to about 3-4 minutes until it is nice and smooth. Be careful as this is super hot. During this time line your large cookie sheet with parchment paper. Fold in the marshmallows until they are fully coated. Scrape the mixture onto the parchment paper, smoothing it out and covering the sheet. Next begin pouring on the M&Ms with your hand to level out the chips. Gently press the M&Ms into the chocolate marshallow mixture so that they adhere. Place the sheet into the fridge, or in my case in the cold garage for about 1 hour to let it become solid. Once solid, cut into bite sized bars and dig in. These Peanut Butter and Chocolate Marshmallow Bars are so good. There is already a great relationship between chocolate and peanut butter, but then you get this great added texture of the M&Ms and the softness of the marshmallows. This is a real treat and a quick and simple treat to bring to any party. Enjoy!